Humsafar Express is a fully AC 3-tier service with all the modern facilities. Prime Minister Narendra Modi on Tuesday flagged off a new bi-weekly train called Champaran Humsafar Express, at the commemoration of the 'Satyagraha se Swachhagraha campaign'. The train will run between Katihar (in Bihar) and New Delhi. PM Modi inaugurated Humsafar Express through a video conference in Motihari. The Humsafar Express is a fully AC 3-tier service with all the modern facilities. Its services long haul routes. The first Humsafar Express train was launched on December 16, 2016 between Gorakhpur and Anand Vihar. 1. PM Narendra Modi flagged off Katihar-New Delhi Humsafar Express on 100th anniversary of Mahatma Gandhi's Champaran Satyagarh, said a PTI report. 2. Indian Railways new Katihar-New Delhi Humsafar Express has 15 stops, as mentioned in a tweet posted by Piyush Goyal, Minister of Railways. 3. According to Mr Goyal's tweet, the new Humsafar Express is open for common public and has many new modern services now. 4. Humsafar Express coaches have mobile charging points and reading lights for each passenger along with easy upper berth climbing arrangement. 5. The coaches also have facilities like baby nappy changing pads, and tea and coffeemakers. 6. 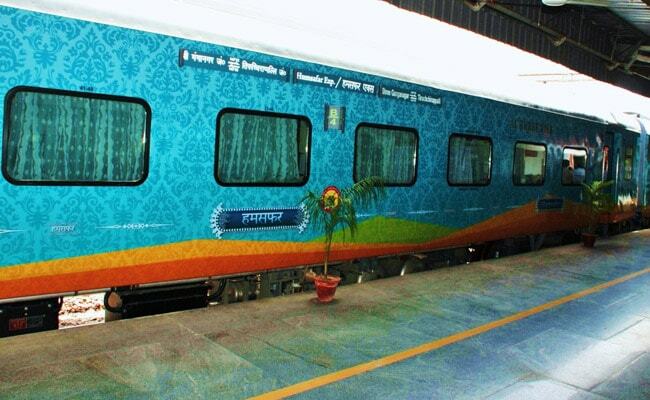 Humsafar Express features side curtains on corridors like AC-2 coaches to maintain privacy. 7. The LED screens on Humsafar Express display information about stations, train speed and others. 8. The exterior of Humsafar Express have a futuristic look with vinyl sheets. 9. The berths of Humsafar Express are now more comfortable than the previous 3-tier AC sleeper with Khadi bedrolls. 10. The coach of Humsafar Express has a heating chamber and a refrigerating box to preserve food brought from home.